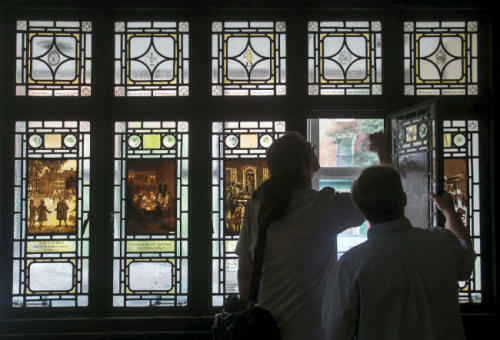 J. Horace Rudy’s stained glass work of Revolutionary War scenes in York, Pa., stood in the old First National Bank building on York’s Continental Square for decades. Here, they are being viewed on a tour of the building, set for redevelopment. Also of interest: The fan club of noted artist J. Horace Rudy keeps growing in York County, Pa.
J. Horace Rudy came to York from Pittsburgh, but he settled into his new home more than a century ago to make an impact that is remembered today. He’s known for his stained glass work, his paintings and his curatorial work. But particularly his stained glass work. This MediaCenter photo gallery takes you on a tour of several pieces of his legacy. You can see his work up close at an extended tour of his work is available at Rudy Art Glass. This image, from Stephen H. Smith’s YorksPast blog, shows the reach of Rudy’s artwork. This scene comes from a mausoleum in York’s Prospect Hill Cemetery.